What do you mean by linking these accounts? You will only have an account on either of these websites if you registered for one. Of course you can make accounts on both websites with the same personal information, our databases are separate so this would not conflict. in regards to purchasing a discount subscription. it is 50 euro a year, but you must link the card and NS to the same person (personal OV card). When I try to link the NS account with the OV account , it is impossible. Yes, and its also (again) quite strange that NS-staff does not know the answer. 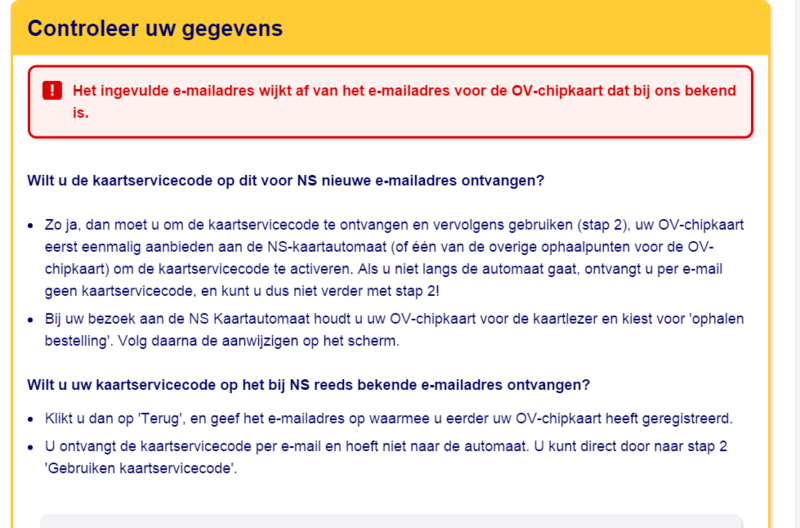 It is MADE like that-IMpossible, in the times of set-up of this whole (and also for us Dutch very confusing) chipcardsystem. There was a giant fear that what were thought of as competing private companies might have the slightest possibility to look into the client-data of each other. Besides that NS is always thinking it can do better as the others and thus make their own things (this is kind of semi-secret insider-info). It is just that NS was forced at the time-now some 8-9 years ago, to participate in this chipcard system which was primarily thought of as replacing the old national strippenkaart-system for trams/buses.